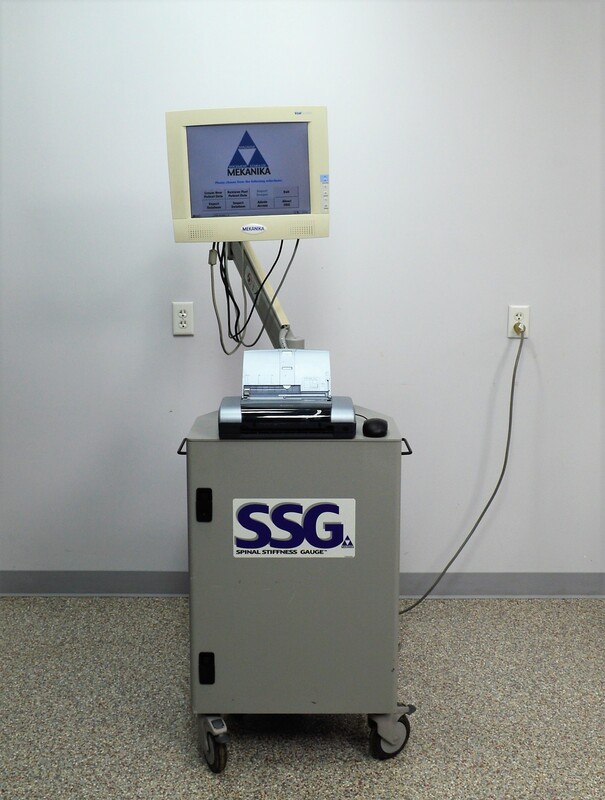 Mekanika Spinal Stiffness Gauge System SSG Orthopedic Research Only . New Life Scientific, Inc. The Spinal Stiffness Gauge is a computer-based, powered intraoperative instrument. By applying a force to, and separating adjacent vertebrae at a constant rate of distraction, the SSG electronically measures the resistance of the adjacent vertebrae to the distraction. This measurement assists the surgeon in determining whether to stabilize or fuse. The Mekanika SSG is in great cosmetic condition and has minor signs of wear. The mobile cart does have one wheel that does not roll well; the rubber coating has a significant portion 'chunked' out that allows the cart to thump. New Life Scientific technicians tested that this instrument powered on and noted the cleanliness inside and out. The Windows 2000 OS boots and the Spinal Stiffness Gauge version 1.2 software loads. The instrument includes the PC, touchscreen, printer, and mobile cart. The user will need to supply a spinal manipulator, but there may be additional hand tools that the physician desires. The printer was powered on only and the 'ink' light blinks; the ink cartridge is a consumable and will not be provided by New Life Scientific. There is no warranty expressed or implied.